David had a long career at Bristol Rovers after being released from the Leeds United youth scheme. He played over 250 games for Rovers in a ten year period, scoring some 63 League goals. During the 1993/94 season, he had a spell on loan with Exeter City, before leaving joining Walsall at the end of the season. The attacking midfielder then had spells with Northampton Town, Yate Town, Bath City before joining Farnborough Town. 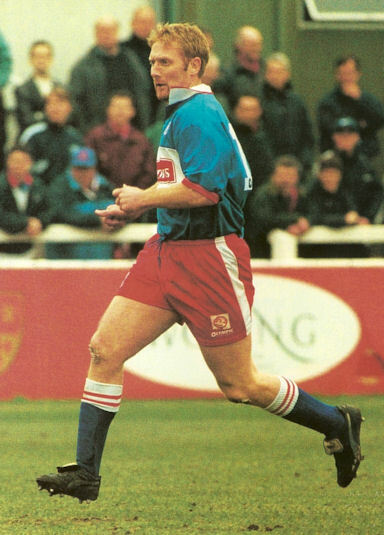 He had featured at Nene Park for Farnborough in their memorable 5-5 draw, but he joined the club in March 1998 for a £50,000 fee as Diamonds attempted to catch Halifax Town for the Conference title. 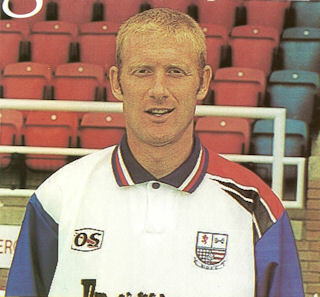 Injuries and other issues meant he did not reappear in the Diamonds first team until well into the 1998/1999 season and it was against his former club that he made his final appearance. Manager Brian Talbot made wholesale changes following a poor performance at home to Northwich Victoria and David was one of the casualties. He had struggled on his return to full-time football due to a long-standing knee problem, and he returned to a part-time role in his native West Country at a number of clubs including Forest Green Rovers, Bath City, Clevedon Town, Paulton Rovers, Brislington, Weston-super-Mare, Bitton and Bristol Manor Farm. In 2008, he took a step into management, taking the reigns at Southern League Premier side Gloucester City, and guiding them into the Conference North in his first season with the club. After working on a non-contract basis for two years while the club were in exile following the floods of 2007 (playing home games at Cirencester), he signed a two year deal in July 2010, to keep him in charge of the club for a further two years, while they made plans to return to Gloucester. With the club struggling in the relegation places, his final game in charge was a 1-1 draw against North Ferriby United on 22 February 2014, and he was sacked after the game. He then returned to the helm at Mangotsfield until the end of August 2017.